Salamanca is located in the mid-west area of Spain in the province of Castilla y Len, 2-3 hours drive from Madrid and 1 hour away from the Portuguese border. It has a population of 165.000 inhabitants and a climate, which during the winter can be rainy and cold whereas the rest of the year is dry with comfortable temperatures. Salamanca is one of the most famous university towns in Spain with more 40.000 students studying in the town each year. The University of Salamanca dates back to 1218, which makes it the third oldest university in Europe. 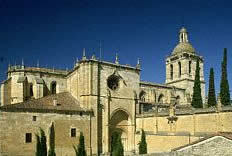 Apart from the university Salamanca is known for its many monuments and special architecture. In the center of the town all buildings are constructed with golden sandstone (the special Villamayor stone), which gives the visitor the impression being in another time period. Today Salamanca is a lively mixture between a modern city, a university town and a little village, which offers the many visitors advantages of each (a good infrastructure combined with a young and welcoming atmosphere). Salamanca is this year (2002) named as European Capital of Culture and is also a UNESCO World Heritage City. The town is a very popular tourist destination and it offers its visitors plenty of interesting things to see and do. Among foreign students who wish to study Spanish in Spain Salamanca has always been very popular due to the Spanish spoken in the area, which is the purest in Spain. In spite of its small population Salamanca offers many opportunities for going out at night. The students meet in the central squares or bars for a chat, a drink or a tapa (snack). The relaxed atmosphere during the day in the center goes on to late night where it gets mixed by the music from the many bars.